CANADA - Nullifying the well publicised impact of dairy cows on the environment is vital for the longevity of the sector and anaerobic digestion could be the answer, according to Dairy Farmers of Canada. 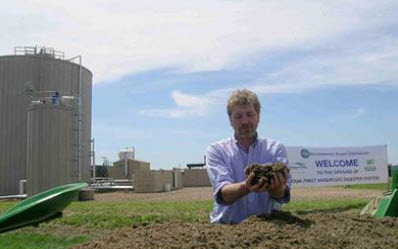 Anaerobic digestion of manure is one tool that farmers are using on Canadian farms. This picture shows the material that comes from digesting dairy manure. The end products include electricity, nutrients that are put back on the fields and dry matter that can be used for bedding the cows. For anyone interested in sustainable agriculture, I recommend you check out what four dairy farm families in Canada are doing to make their farms sustainably viable into the future. These farmers were recipients of the 2012 Dairy Farm Sustainability Award. If you know a farmer who deserves recognition for the innovative and sustainable practices that they undertake on their operations, nominate them for this year’s award. Anaerobic digesters could be a useful tool for dairymen in the future, improving public perception of milk production and its green credentials. Unfortunately in the public eye, dairy farming’s reputation has been blemished due to the green house gas, methane that cows breathe out. However, people fail to see how dairy farmers are increasingly environmentally careful. I believe that dairy farmers genuinely care about and implement sustainable environmental practices and continue to be good stewards of the land. They continue to find new and innovative ways to reduce, reuse and recycle waste on their farms. All farmers deserve a pat on the back for the hard work and time they continue to invest into environmentally sound practices.